Using an Earth system approach the MONARCH-A project executes systematic provision of tailored information and products to assist climate change research at high latitudes and in the Arctic. The ultimate goal of MONARCH-A is to generate a dedicated information package tailored to a subset of multidisciplinary Essential Climate Variables and their mutual forcing and feedback mechanisms associated with changes in terrestrial carbon and water fluxes, sea level and ocean circulation and the marine carbon cycle in the high latitude and Arctic regions. By adopting an Earth system approach the ultimate goal of the project MONitoring and Assessing Regional Climate change in High latitudes and the Arctic (MONARCH-A) is to generate a dedicated information package tailored to a subset of multidisciplinary Essential Climate Variables (ECVs) and their mutual forcing and feedback mechanisms associated with changes in terrestrial carbon and water fluxes, sea level and ocean circulation and the marine carbon cycle in the high latitude and Arctic regions. 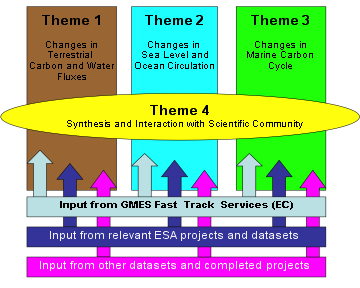 The dedicated information package will be based on the generation of time series of 11 multidisciplinary ECVs including land cover, permafrost, river discharge, snow cover, ice sheet elevation, sea ice drift and volume, sea level, ocean currents and transport of heat and freshwater, ocean color, near surface wind field and CO2 partial pressure. Land cover and fire will use existing sources of data, with particular focus on consistencies between data sources and conversion to forms in which these ECVs can be ingested into the models. Sea ice extent and concentration, sea ice thickness, sea surface temperature, and sea level bounded by ± 65 degrees latitude will be pulled from existing archives and data bases to complement these ECVs. Through reanalyses adequate and consistent description of the status and evolution of the high latitude and Arctic region will be provided in the context of terrestrial carbon and water fluxes, sea level and ocean circulation and marine carbon cycle. It will focus on changes during the last 30 - 50 years. This will ensure new scientific input for the elaboration and implementation of European and international policies and strategies on the environment and society, including climate adaptation strategies addressing European, national, regional and local levels.